Sammamish, Washington, is a city in King County. It’s based on a plateau and bordered by Snoqualmie Valley and Lake Sammamish. The name of the city comes from two American Indian words: samena means hunter and mish means people. 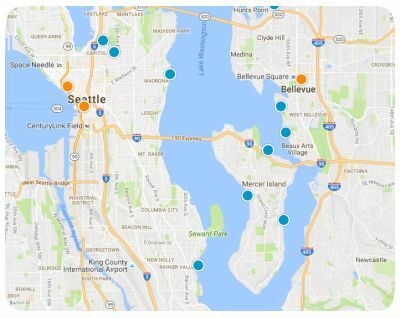 CNN Money ranked Sammamish as one of the best cities in which to live. It’s not hard to see why due to the fact that it mixes a suburban vibe with small-town character, especially since it has a population of approximately 60,000. This city is also a highly family-friendly one because it has many kids between the ages of five and 17: over 25 percent of kids, to be precise. 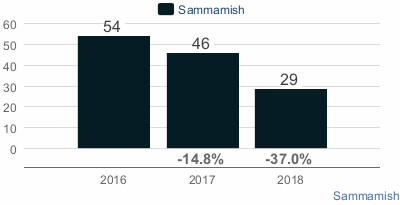 Sammamish is a suburban small city that’s a big advocate of the arts. Sammamish Arts Fair is one of the most popular art fairs in the state. You’ll find lots of artworks in the City Hall building: paintings, glass art, photography, mixed-media, textile art, printmaking and more. Other types of arts in the fair include music and performing arts. The fair takes place every year on September. Take a walk or bike ride on the East Lake Sammamish Trail. It’s 11 miles long and runs through Issaquah, Redmond, and Sammamish. Sammamish Cafe is a popular 1950s-style eatery for getting a quick snack or a full meal. It serves breakfast, lunch, and dinner including pancakes, French toast, potato burritos, burgers, sandwiches, pot roast, steak and other entrees. For a scary good time, check out “Nightmare at Bear Lake,” an attraction that takes place at Bear Lake Park on Halloween. It’s a volunteer-run event featuring “monsters” who scare people in indoor and outdoor settings. Sammamish has two school public school districts: Lake Washington School District and Issaquah School District. It’s also home to one private Catholic school. 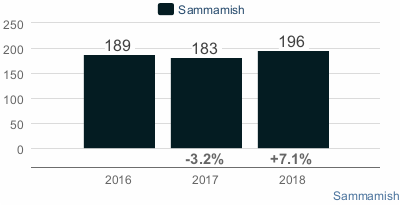 About 87 percent of homes in Sammamish are single family dwellings. 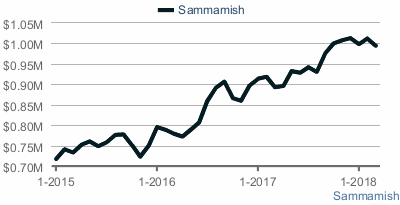 Other types of Sammamish real estate properties include townhouses, mobile homes, and apartments. Most residences were built during the years 1970-1999, and many of them have four bedrooms. 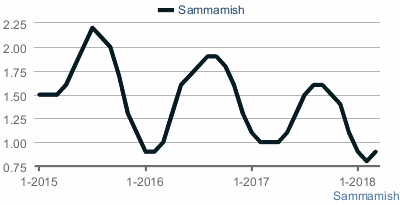 Sammamish has lots of great attributes. It has high-rated schools, a low crime rate, an excellent economy and friendly residents. If you’re interested in homes for sale in Sammamish, Washington, please contact us today.